Cablecast is all about making things easier - creating an infrastructure that enables advertisers, whether local, regional or national, to get more out of their media spend. Cablecast is a national cable TV advertiser with an ability to run advertising campaigns on cable networks across Pakistan. We’re focused on new technologies, products and apps that will help advertisers reach, engage and connect with audiences effectively and efficiently, getting them in front of eyeballs no matter where they're focused. 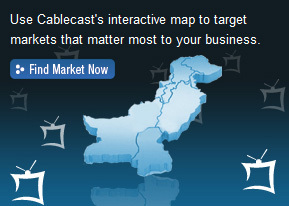 We provide direct access to over 80% of Pakistani cable homes through advertising on in-house cable channels. We at Cablecast are focused towards improving the cable advertising standards for our clients. Explore the site to discover the many dynamic tools and exciting branding opportunities or contact a Cablecast representative to discuss how the full resources of Cablecast can help boost marketing plans. Download a PDF of Cablecast's Media Kit. Contact us directly to get your questions answered quickly.